Most people know what the inside of an Irish pub looks like. Partly because they all look almost exactly the same, and partly because nearly every city has one. But what if yours doesn’t, or you just want something a little extra special and extra convenient? Well, that’s where inflatable Irish pubs come in. The original inflatable pub in the United States is The Paddy Wagon Pub. It’s a 30-foot by 30-foot bouncy house-style rentable that comes complete with fake wooden doors and the appearance of a thatched roof. The business started in the British Isles, and has been operating in the U.S. since 2015. But The Paddy Wagon Pub isn’t simply your everyday bouncy house rental company — it’s full-on entertainment central. The company can arrange a personal DJ, live Irish music with a four-piece band, Irish dancers, a beer tap with a bartender who can teach people how to do a proper pour, and live Irish Wolfhounds. Yes, Irish Wolfhounds, those wire-haired giants that can get nearly three feet tall. You’ll never think of brick-and-mortar pubs the same. Naturally, The Paddy Wagon Pub is based in Boston. If you’re not in Boston, though, you’re not out of luck. Turns out there’s a whole industry around inflatable pubs. 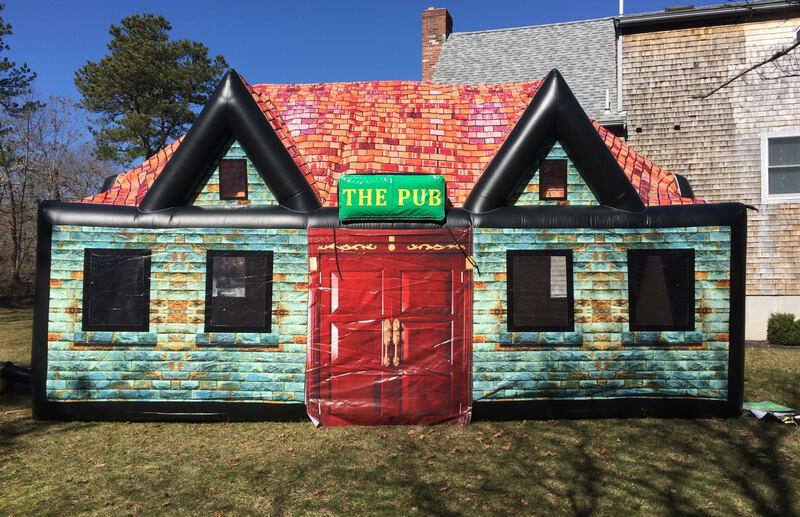 The Inflatable Pub company rents out pubs from coast to coast in the United States (and in England and Ireland). Tired of renting and just want an Irish pub in your back yard at all times? Then just buy one. They range in price from $2,500 to $5,900 depending on style and size, and come with a personalized name. All the usual excuses for not being able to make it out to the pub — it’s too cold, it’s too hot, you don’t have a ride, etc. — are null and void when the pub is right outside your back door. With an inflatable Irish Pub, every hour is Guinness hour.